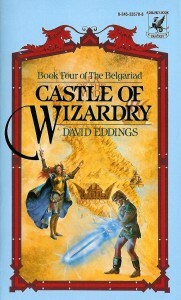 Just saw the David Eddings post from a random retweet in my twitter feed. Similarly, I discovered the Belgariad around 5th grade, but unfortunately, never finished it. I might be feeling just nostalgic enough to purchase Book One again, thanks to your post. Good luck w/ the novel. Keep writing! The Belgariad and its sequel the Mallorean are like old friends to me. I reread them about once a year. Novel’s going well. Thanks! 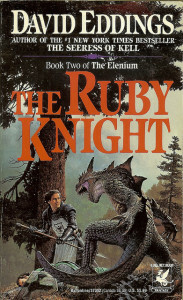 What’s really weird is that the second book in the original series, “Queen of Sorcery”, was the first one that I read. 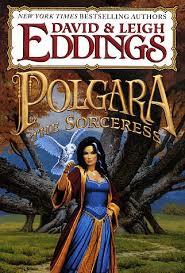 After more than 20 years, I just obtained the audio-book versions, and just started “Queen of Sorcery”. 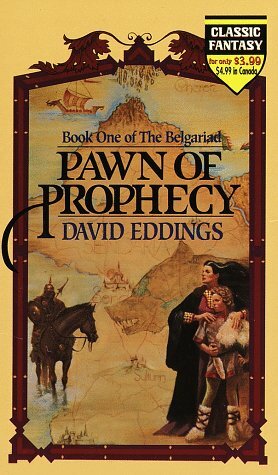 Having just listened to “Pawn of Prophesy”, and experienced a kind of deja-vu, remembering the time in my childhood when I first experienced this book, the impact in had on my psyche, etc, the impact of those first words, and remembering the intial impact that first reading of Eddings had on me. I think it was a combination of here was an author who really got my male pre-teen agnst and here was an author who had some insight to offer into pre-teen girls. That was probaly a result of co-authoring with his wife, and really comes through in his portrayal of his female characters. 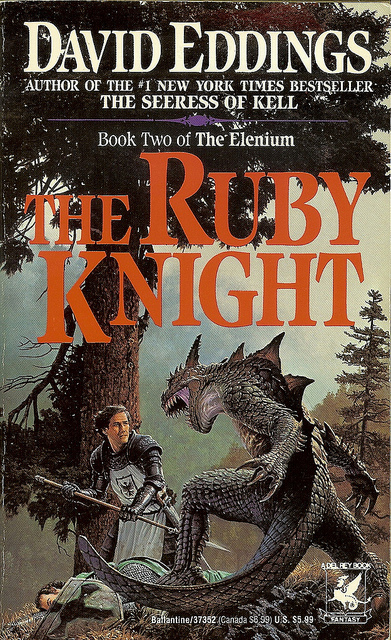 I loved these books as a teen. 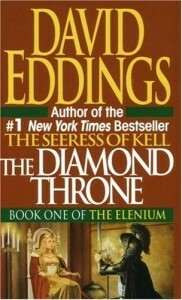 Even though I don’t write in the same genre, I learned so much from Eddings about dialogue and character development. He is a master of witty banter! Yes, his dialogue is the best! Love the way his characters quip. I really appreciate you writing this post! 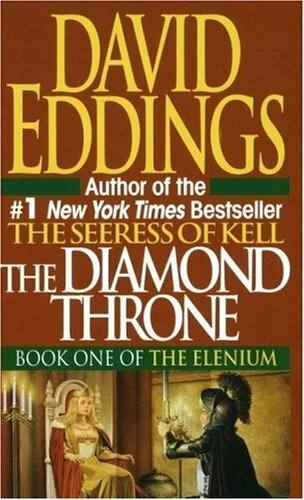 While many of my fellow geeky friends had read/were reading Tolkien, I was reading Eddings. I happened on Pawn of Prophecy when I started community college straight out of high school. I ‘devoured’ the rest of the series in months! I then read his Belgareth the Sorcerer and that was a milestone for me as it was the thickest book I’d ever read at that point (711 pages) before HP and The Order of the Phoenix many years later. 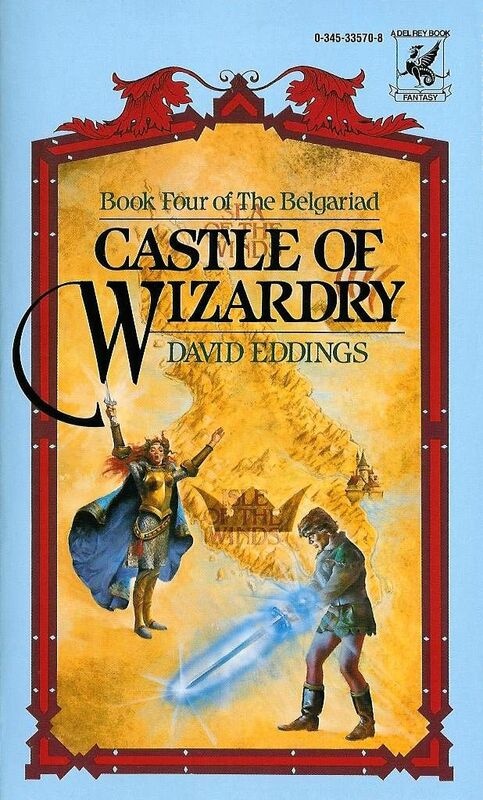 I’ve learned much about world-building because of Eddings and his wife. Belgareth and his daughter ‘Poli’ are two of my favorite characters in fiction! The different gods, cultures and religions in his books helped create the blueprint for my anthropomorphic cat epic fantasy series (6 short stories published thus far & counting). I mourned his death and he has a place on my blog list of beloved writers. Cheers for taking me down memory lane! You’re welcome! I’m glad you enjoyed the article! “My poor DM (Dungeon Master or the guy who runs a Roleplaying Game session, such as D&D) can attest to my love of banter and mocking my enemies as I fight them, mocking his enemies as they try and reveal their evil plans, and it’s all because of David Eddings. His heroes always make light in the face of their enemies with a fun bravado worthy of a hero of an epic story.” … ha ha! I love it! Terrific post … your intelligence, sense of humor, and love of the fantasy genre really shines through. As an aside, I visited Washington for the first time about a year ago. My son is looking at DigiPen, and I was very excited to have an excuse to fly to Seattle. While we were there, we had one full day without rain. We were very excited. Glad you enjoyed the post. I had a friend from high school attend DigiPen. I enjoyed this article and am now feeling nostalgic. I’ve replaced all the books in my Belgariad collection at least once, and a few of the Mallorean (they were very well loved). My rereads have spread out to once every three years or so. But, after this, a couple of weeks of indulgence may be just around the corner. Your fondness for the stories is obvious, love it. I try to listen to the audiobooks every year or so. I did wear out my original paperbacks. Hope you enjoy your reread.